Best Buy’s outlet center has a 58″ Samsung Plasma for $1499. That’s $800 (about 1/3) off the regular list price of $2299. The PN58B550T2 is a 1080p display with 600Hz Subfield Motion technology — making fast action smooth and sharp at 0.001 ms response time. In addition, the display’s antiglare technology called FilterBright reduces glare in lit environments for a better picture. Other features of the PN58B550T2 include built-in HDTV tuner, 16:9 aspect ratio, 4 HDMI inputs, USB port, PC input, two 15W speakers, and Energy Star compliance. Best Buy’s Outlet Center is not only offering a great deal on this HDTV, they are also providing free shipping. Limited quantities are available. In-store pick up is available at some stores. 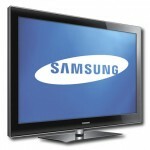 Visit the Best Buy Outlet Center and search for Samsung model PN58B550T2. I got this TV at Best Buy for $1399 last week. There’s not many left, but if you go in the store you can get it for $1399. Also, they have a deal right now, if you buy a certain Yamaha receiver you get some money off of a nice Klipsh speaker set and an upgraded subwoofer. I don’t remember how much you get off, I think it was $250, which almost makes the receiver free. the only problem is that the receiver may have all the features you need, but isn’t great quality.